Hello! 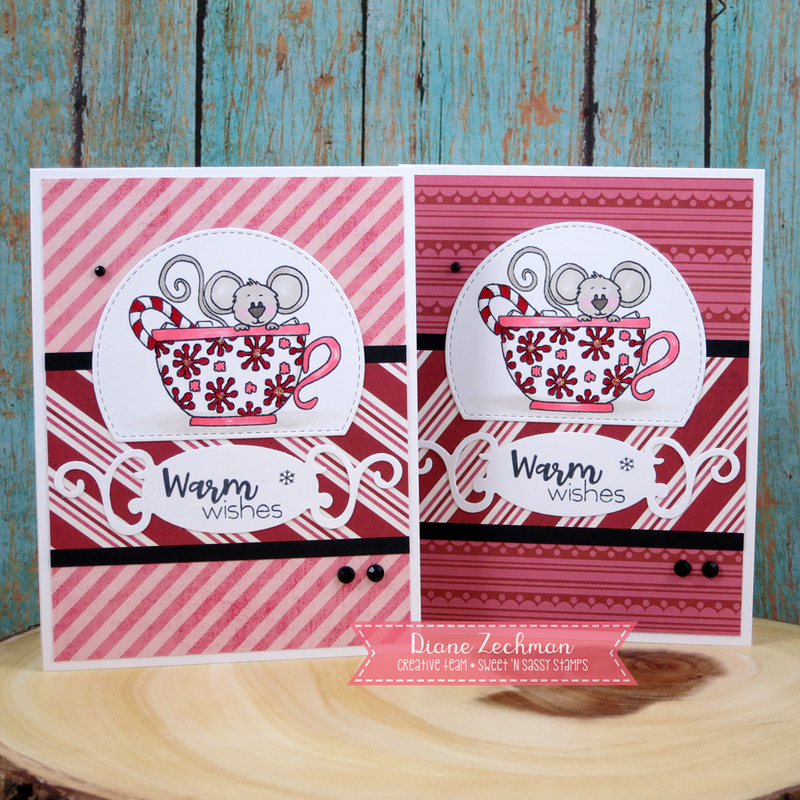 I have two more cards today using the Sweet ‘n Sassy Cocoa’s Cups set. Don’t forget about the SNSS specials this month to go along with the November birthday release! Tonight is the last chance to take advantage of the Black Friday special! I love this image of Cocoa Mouse in the holiday cup. So sweet! stamps- Sweet ‘n Sassy Cocoa’s Cups; paper- white, black, MME Merry Little Christmas; ink- Memento Tuxedo Black; accessories- Copics, MFT Stitched Arch Stax, Spellbinders Fancy Tags, Stickles, gemstones. Happy Thanksgiving! I hope you are able to spend time with family today and reflect on all you are thankful for. I have two CAS thank you cards to share using Sweet ‘n Sassy stamps. 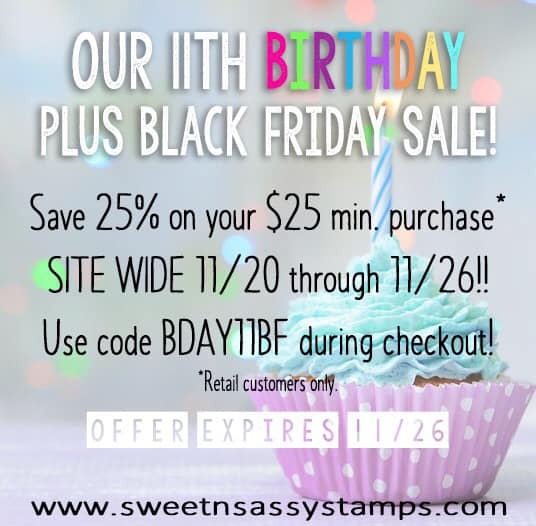 Don’t forget about the SNSS specials this month to go along with the November birthday release! 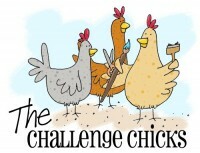 …and the second one for Christmas! 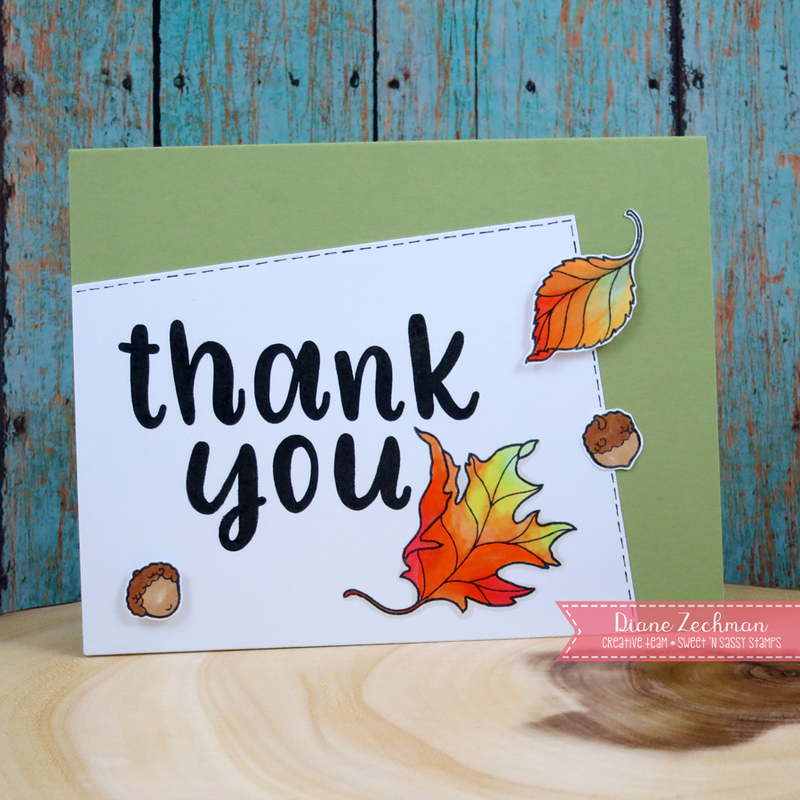 stamps- Sweet ‘n Sassy Give Thanks and Chunky Lowercase Alpha; paper- white, red, SU! Pear Pizzazz and Always Artichoke; ink- Memento Tuxedo Black; accessories- Copics, Stickles, ribbon, MFT Blueprints 15, foam dimensionals. Hello friends! We are in the midst of some home remodeling and I’ve neglected my blog the past two weeks but today I have two cards to share using some Sweet ‘n Sassy stamps from the November birthday release. SNSS has TWO special throwback sets this month. Here I used Cocoa’s Cups. They are also celebrating their 11th anniversary with various weekly specials. 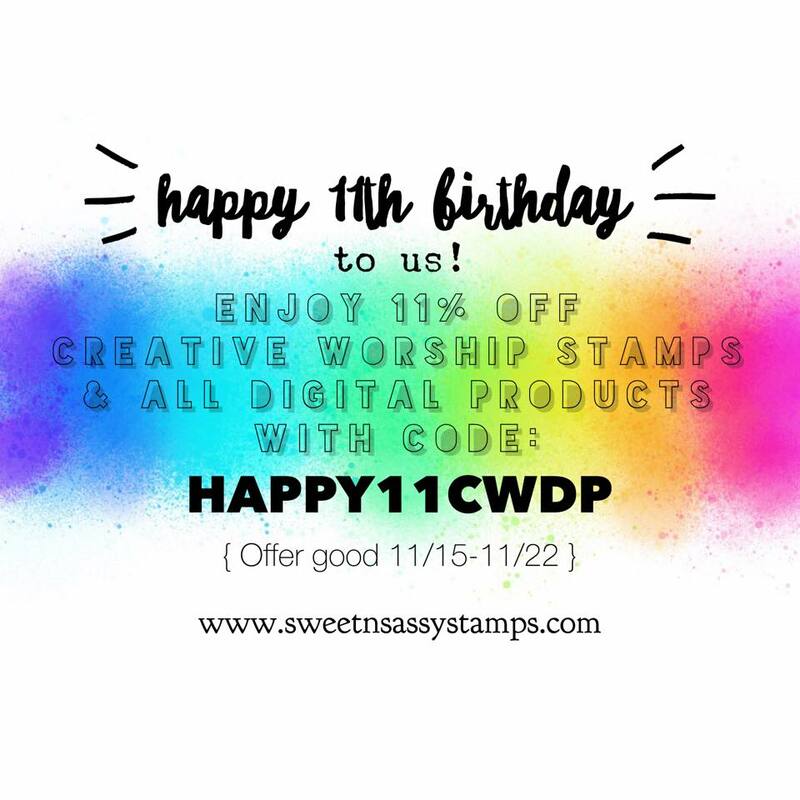 This week you can save 11% on the Creative Worship and digital products. My first card has an open middle in the card front with my image panel bridging the top and bottom sections and holding the bottom in place. 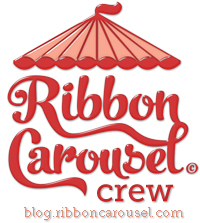 I was reminded of this design and inspired by a card Michelle Zindorf had recently done. 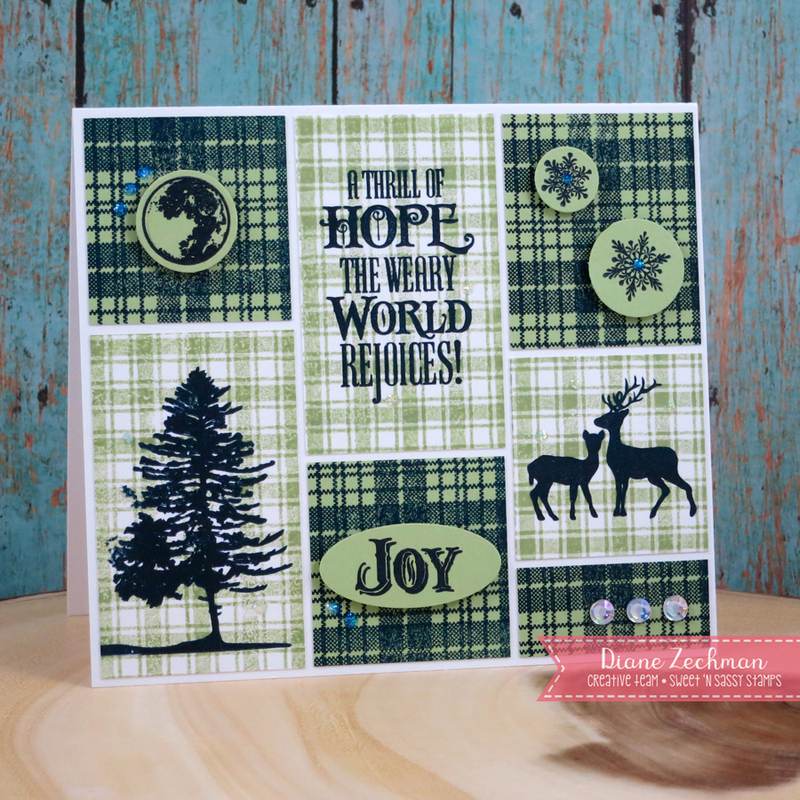 On this card I also used the Texture Tiles 4 set to create the plaid backgrounds. The coffee cup was paper pieced with some coordinating paper scraps from my stash. A few flakes, gemstones, and enamel dots finish it off. This is such a fun card design! For my second card, I decided to create a shaker. Here I also used the Chunky Lowercase Alpha. I placed some various shapes of sequins inside. 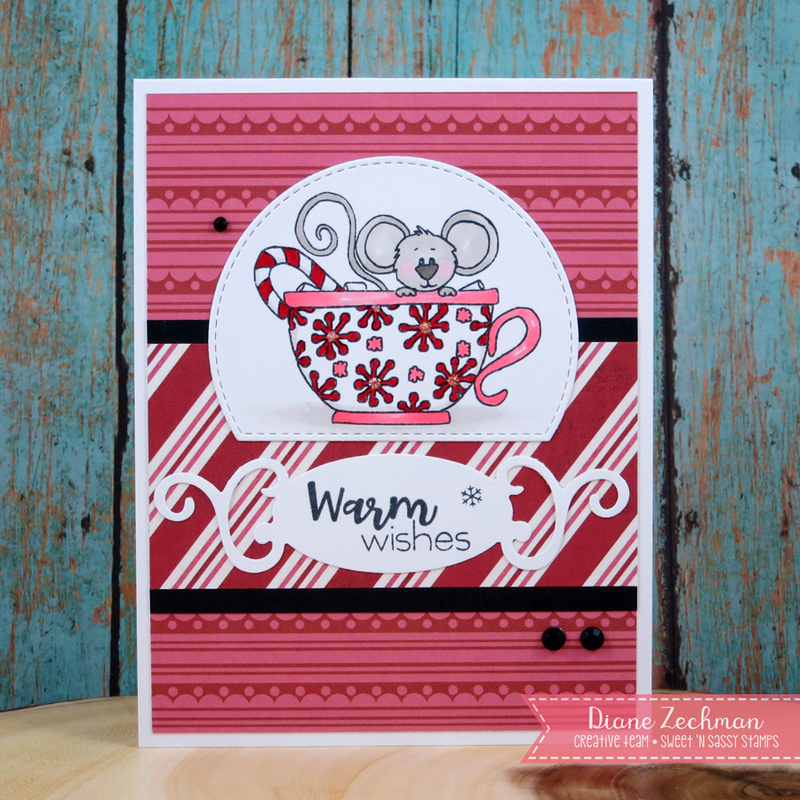 stamps- Sweet ‘n Sassy Cocoa’s Cups, Texture Tiles 4, and Chunky Lowercase Alpha; paper- white, SU! Always Artichoke, Riding Hood Red, Pear Pizzazz, and Pink Pirouette, scrap designer papers; ink- Memento Tuxedo Black, SU! Always Artichoke; accessories- Copics, foam dimensionals, foam tape, enamel dots, Martha Stewart Polar punch, gemstones, MFT Stitched Rectangle Frames, acetate, sequins, Scor-Tape. Hello! 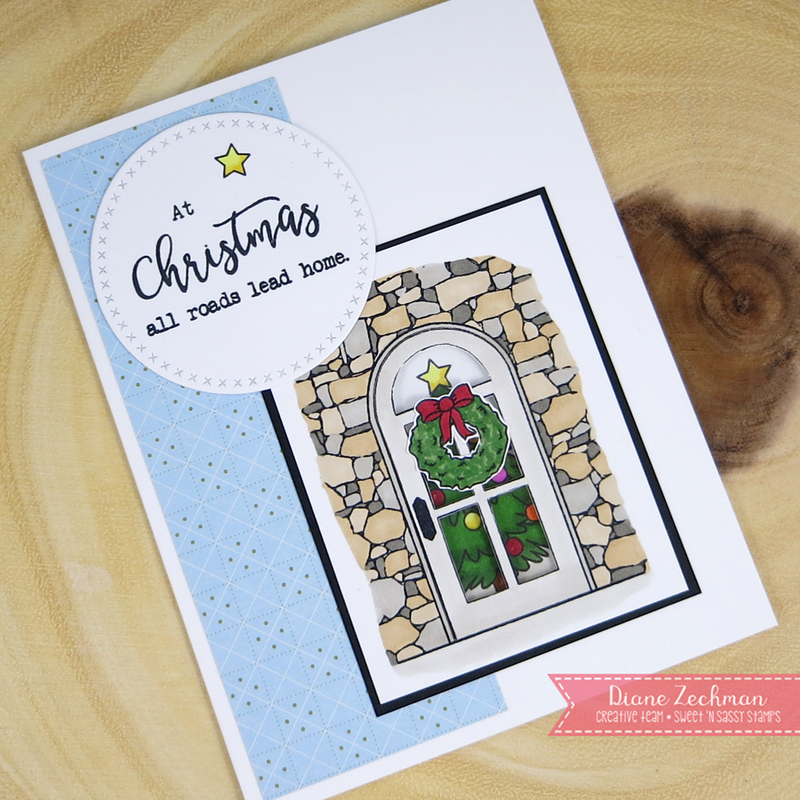 Halloween is only a day away but today I am sharing my last two Christmas cards using Sweet ‘n Sassy stamps from the October Release. Here I used Thrill of Hope and Texture Tiles 4. The first card is CAS with some ink sponging on the background. Some snowflakes were stamped in black and others with blue ink. 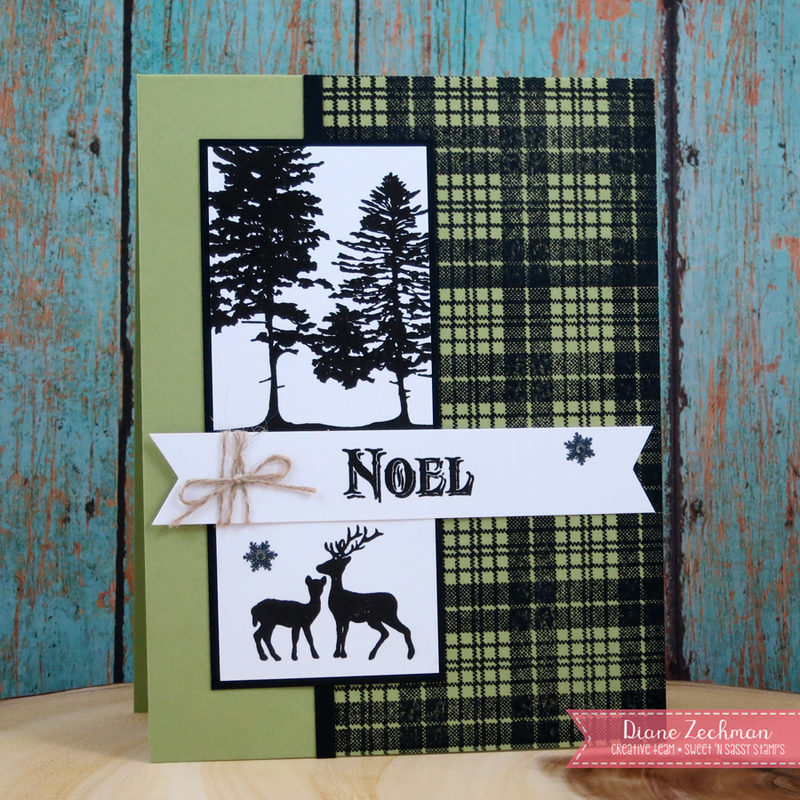 I stamped the tree line monochromatic on the second card and the deer were stamped over a scrap of plaid from Texture Tiles 4 which was left over from another project. Love those deer! stamps- Sweet ‘n Sassy Thrill of Hope and Texture Tiles 4; paper- white, black, SU! Pool Party, Baja Breeze, Pear Pizzazz and Crumb Cake; ink- Memento Tuxedo Black, SU! Pool Party, Real Red and Crumb Cake; accessories- Stickles, Martha Stewart Holly Leaf punch, twine. Happy Saturday! 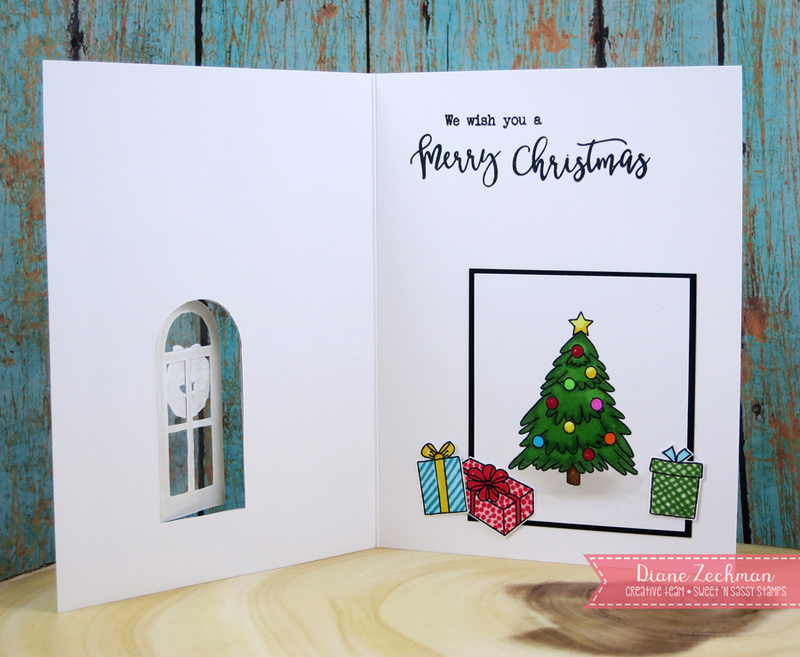 The SNSS teams are working ahead for Christmas and today I have two cards to share using some Sweet ‘n Sassy stamps from the October Release. Here I used Thrill of Hope and Texture Tiles 4. For my first card, I stamped the images in black and then used black ink again with a plaid from Texture Tiles 4 to create the background. 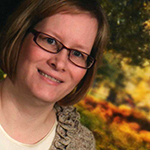 The images on my second card were stamped with navy ink. I first stamped some green and blue plaids and cut them to sizes that would piece together nicely. stamps- Sweet ‘n Sassy Thrill of Hope and Texture Tiles 4; paper- white, black, SU! Pear Pizzazz and Certainly Celery; ink- Memento Tuxedo Black, Versafine Black, SU! Certainly Celery, Night of Navy, Dapper Denim; accessories- foam dimensionals, gemstones, Stickles, linen thread, circle punches. Good morning! 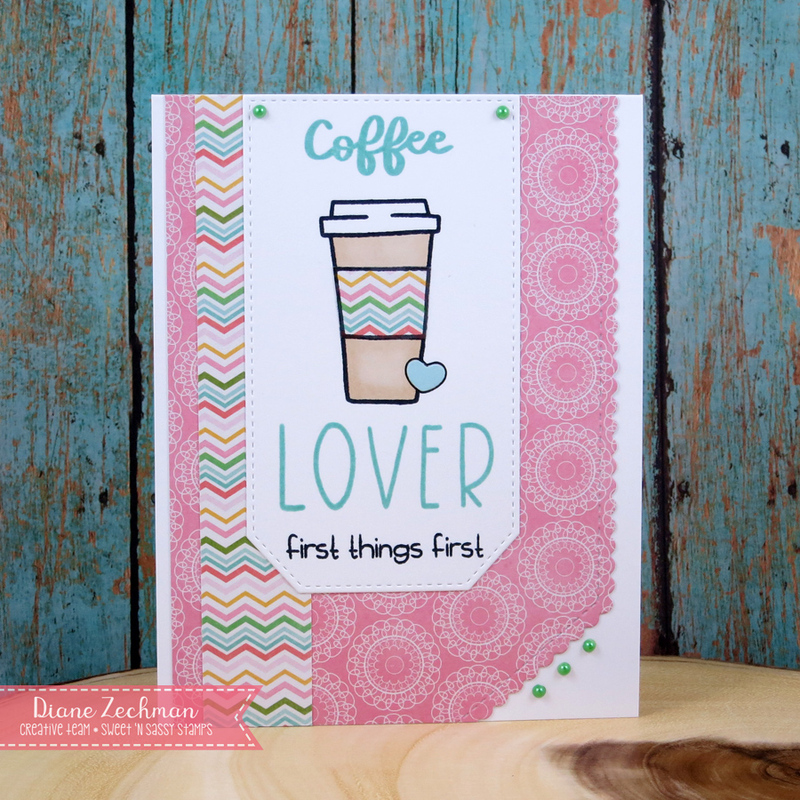 Today I have two cards to share using some Sweet ‘n Sassy stamps from the October Release. Here I used All Wrapped Up. 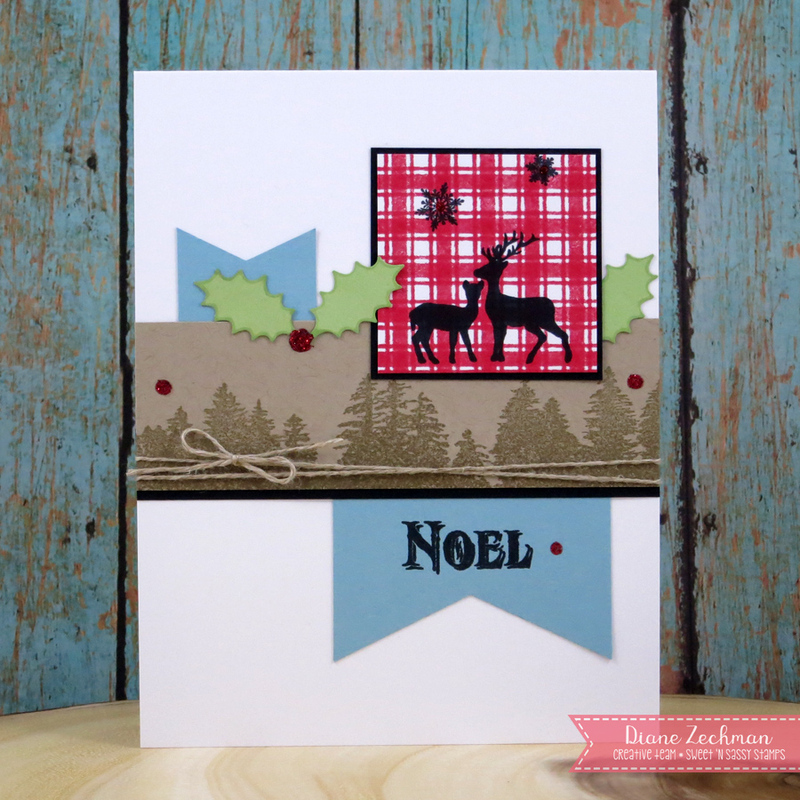 On my first card, I did some simple masking to stamp the presents…then colored with Copics. The tiny snowflakes on the last present are from Thrill of Hope. The plaids are so popular now…even in wrapping paper! Here I stamped a plaid from the October Stamp of The Month set, Texture Tiles 4, and used it for my background. I also used a small piece to stamp the present on. The present was stamped a second time on white cardstock and just the ribbon was colored, cut out, and layered on top. stamps- Sweet ‘n Sassy All Wrapped Up, Thrill of Hope and Texture Tiles 4; paper- white, black, red; ink- Memento Tuxedo Black, SU! Certainly Celery; accessories- Copics, ribbon, gemstones, Stickles, 1 3/4″ punch. Good morning! 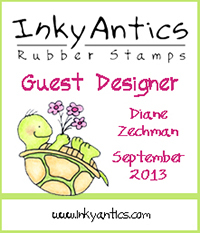 Today I am sharing my last 2 card samples using stamps from the Sweet ‘n Sassy September Release. Here I used Christmas Word Art. I randomly sponged a background over a stencil for the first card, then added a few stars. The main panel also has a sponged background with a few swipes of a damp cloth over the blue stamped words. 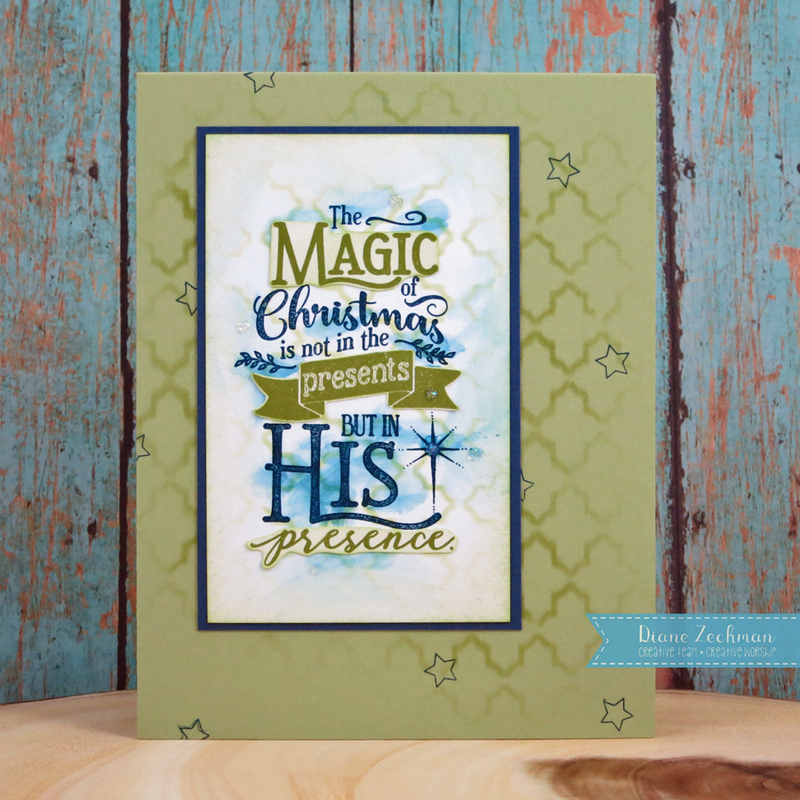 Then I stamped a few of the words in green and cut them out to adhere on top of the blue. You can’t see the few dots of sparkle added to this! 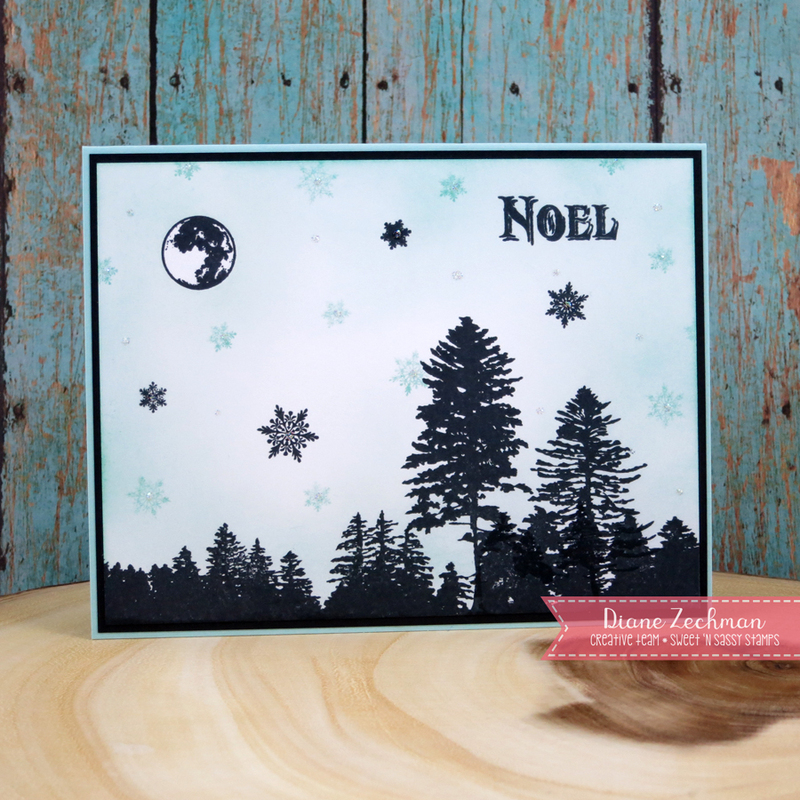 I stamped the deer head and snowflakes using my MISTI on this one. The words were stamped in black and then water-colored over with blue & green. Korin has a knack for putting the word art together! I will definitely be using this set for some Christmas cards this year! 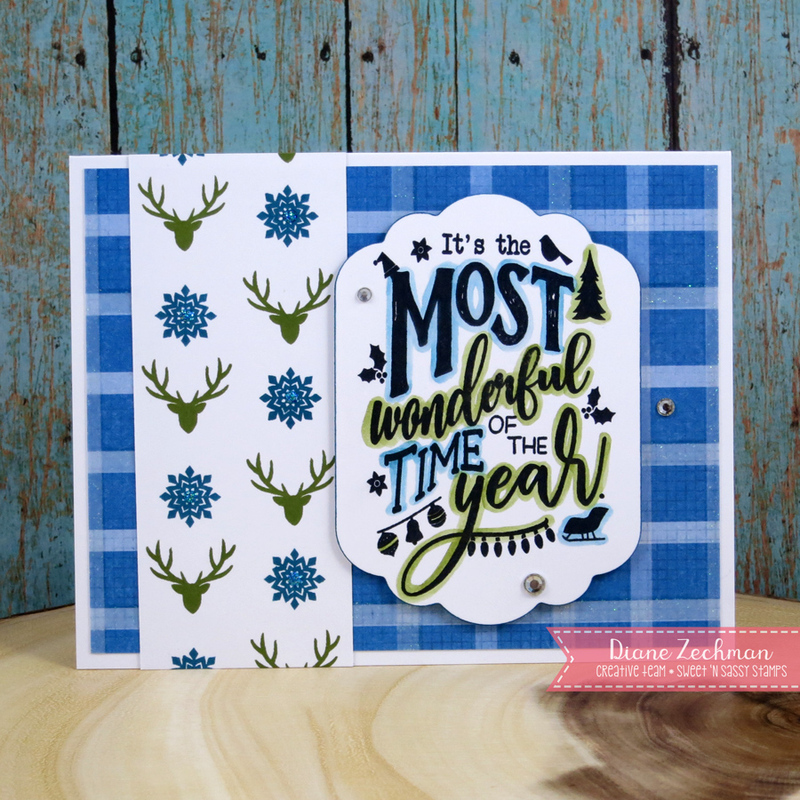 stamps- Sweet ‘n Sassy Christmas Word Art; paper- white, navy, SU! Pear Pizzazz, DCWV dots, stripes & plaids; ink- Memento Tuxedo Black, SU! Certainly Celery, Dapper Denim, Pear Pizzazz, Old Olive, Island Indigo; accessories- TCW Mini Quatrefoil Reversed stencil, stickles, Spellbinders Labels Eleven, foam tape, gemstones. Hello! 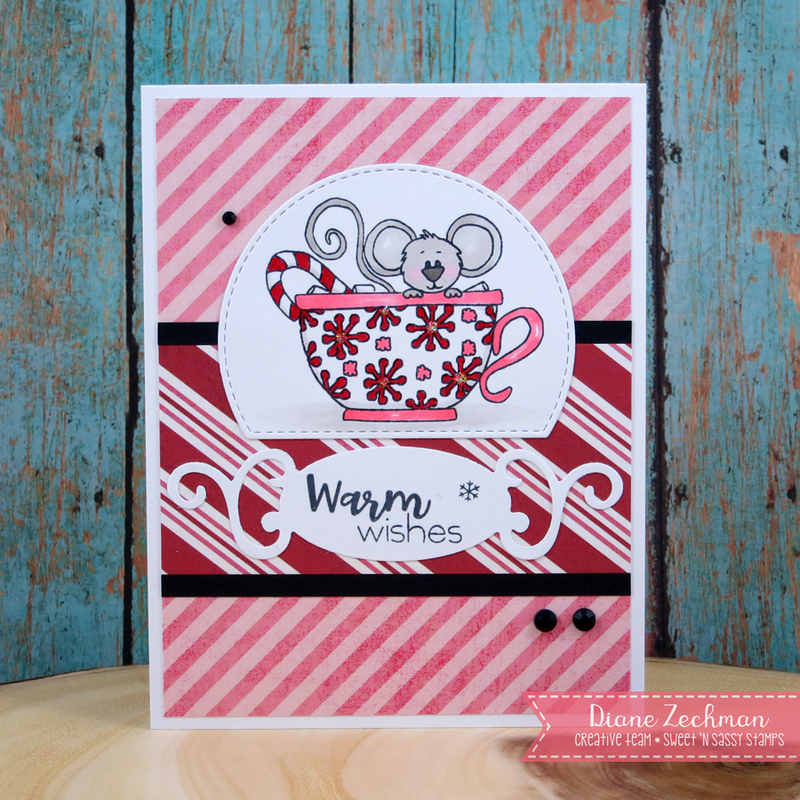 I have a fun card to share today with another one of the new sets from the Sweet ‘n Sassy September Release. Here I used Home For The Holidays. I love the image of the door with the stones around it! I decided that I wanted to be able to peek through the door and see the tree inside so I carefully cut the panes out with an exacto knife and placed some clear acetate on the inside of the door to resemble glass. I also cut the center from the wreath image and “hung” it on the door. 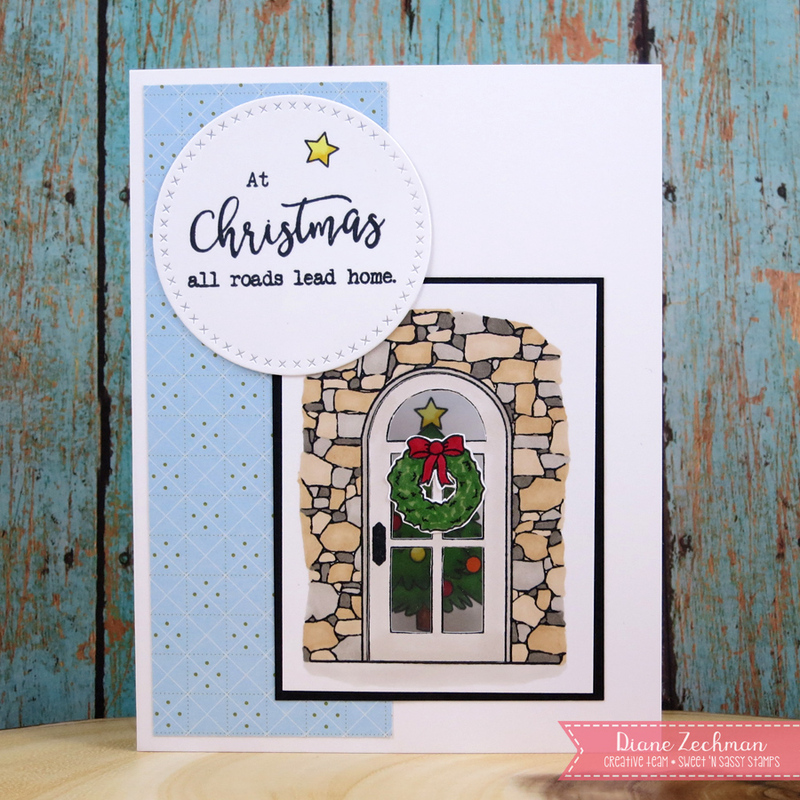 I stamped and colored my door image and then stamped it again onto my card front. 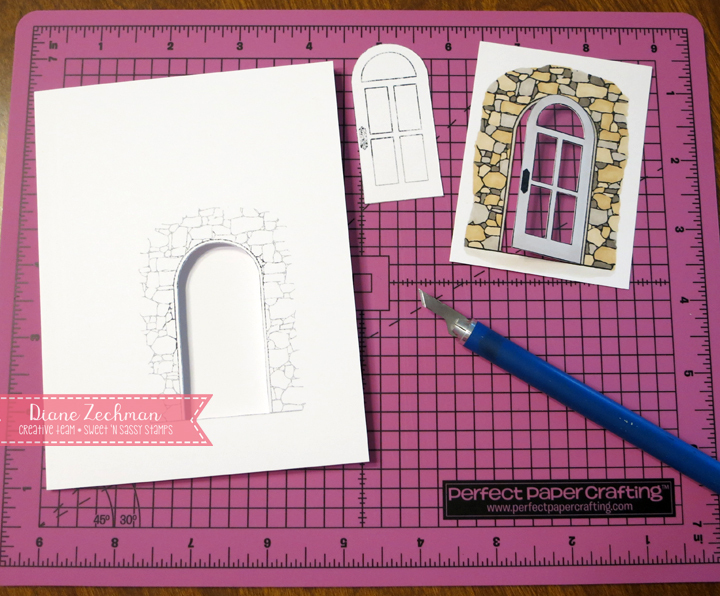 The entire door was cut from the card base and then I just cut part of the way around it on my image panel so the door remained attached and could be opened. 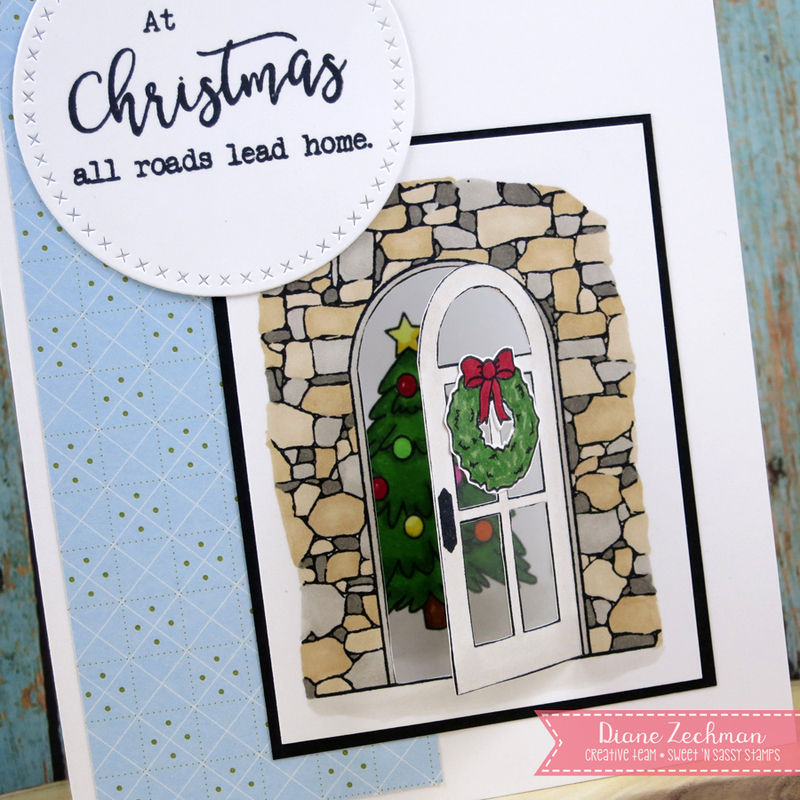 I used the white door that was cut out to use as a pattern for the acetate that was attached inside the door that opens. The tree was adhered inside so it lined up behind the door. Here’s the inside with a greeting and a few presents. 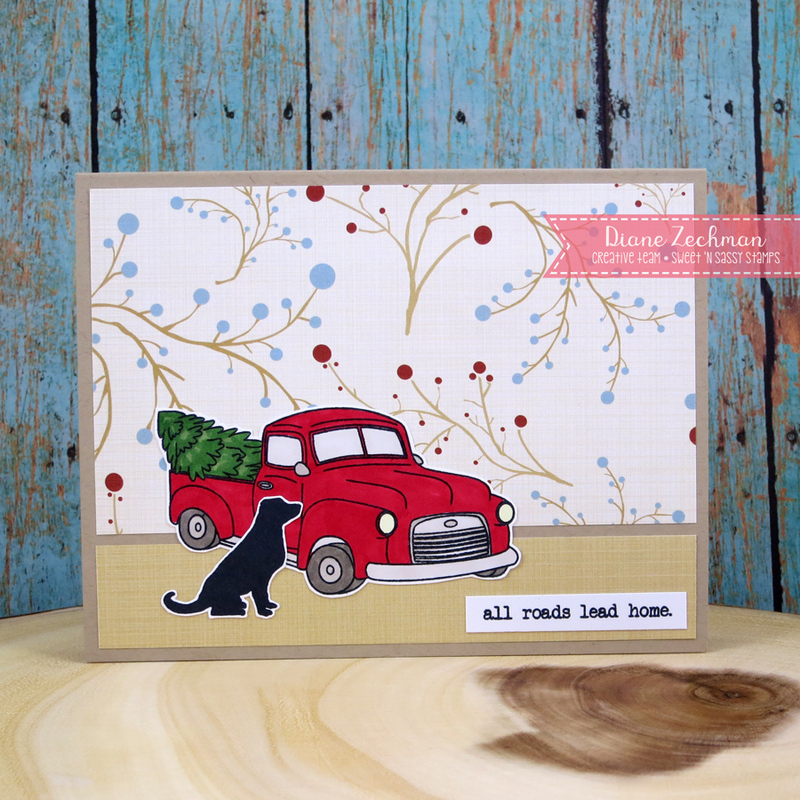 And here’s one more card with this set… with the truck and sweet pup! stamps- Sweet ‘n Sassy Home For The Holidays; paper- white, black, scrap dsp; ink- Memento Tuxedo Black; accessories- Copics. craft knife, cutting mat, acetate, MFT Cross Stitch Circles. Good morning! September is usually full of Christmas in the crafting community so everyone can get a jump start on their holiday projects. 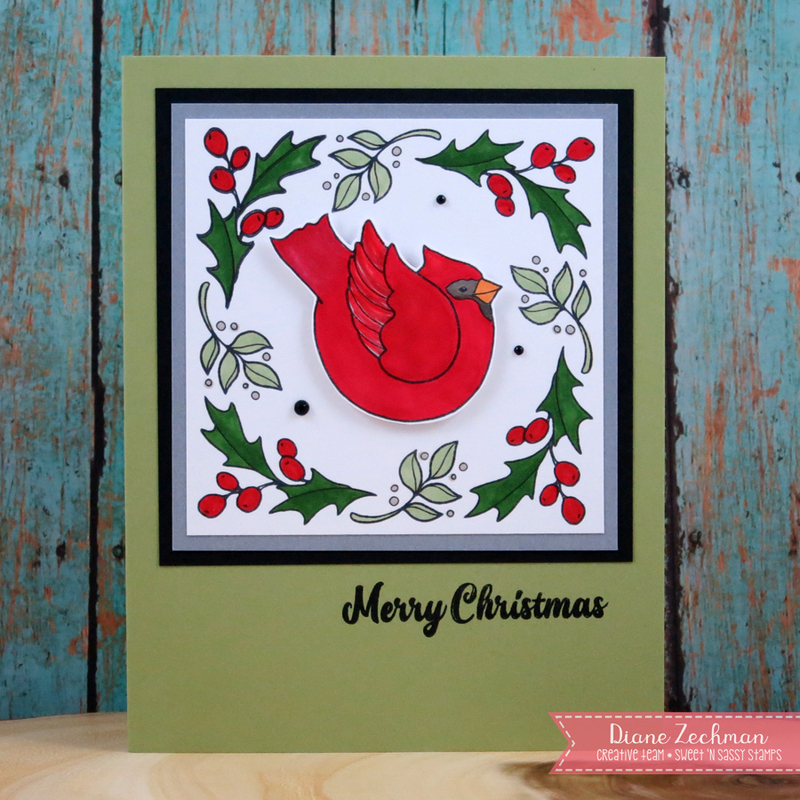 Today I have two cards to share using some new Christmas images from the Sweet ‘n Sassy stamps September Release. Here I used Winter Birds to create 2 CAS cards. I started with a pear green base for both. On the first one, I overlapped three of the images in different shades of green. 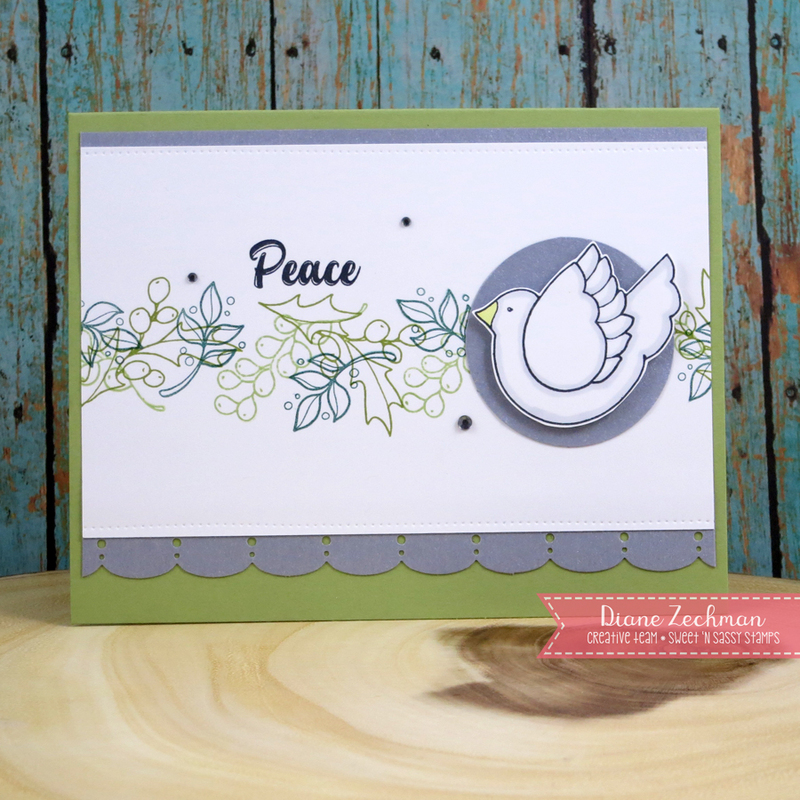 Then I added a silver cardstock circle and popped up the dove. On my second card, two of the leaves were stamped around the edges to frame the cardinal which was also popped up. Have you started on your holiday cards? I hope these give some inspiration! stamps- Sweet ‘n Sassy Winter Birds; paper- white, black, silver, SU! Pear Pizzazz; ink- Memento Tuxedo Black, SU! Pear Pizzazz, Certainly Celery, and Tranquil Tide; accessories- Copics, Gina K. Wreath Builder, foam dimensionals, rhinestones, 1 3/4″ circle punch, Martha Stewart traditional scallop punch.